Exactly a week ago, we were in Singapore. Our dear host Jailani took us for a tosay and teh tarik breakfast at Tek Kah - a must-stopover for us whenever we cross the Causeway to Temasek. We were given a special treat - a Saturday morning car ride to MacRitchie Reservoir. 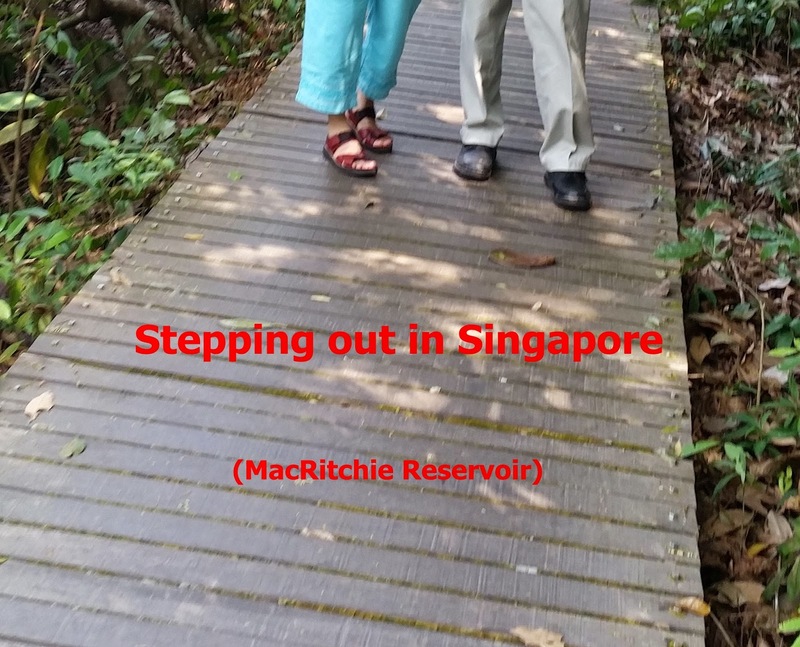 I've always remembered MacRitchie as a venue for P. Ramlee's movies. This video was taken from the 1957 'Bujang Lapok'. It was also where we were taken by our Guide Captain to undergo the Trekking test - to earn our Second Class Badge. My very own Second Class badge. Miss Lam would lay out the trail of sticks and stones and leaves for us to translate into directions for our route through the Reservoir's forest. 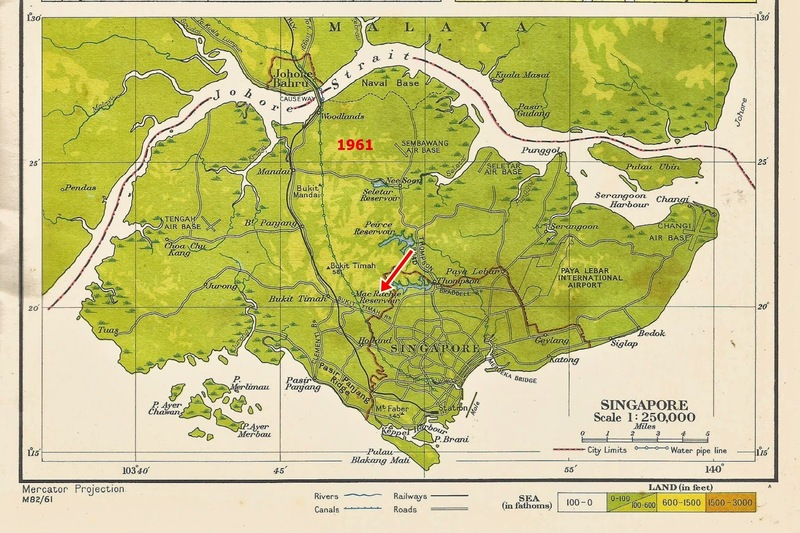 Here's a 1961 map of Singapore - the red arrow points to MacRitchie Reservoir. This map was extracted from Collins-Longman's World Atlas for Malaya - part of my Secondary School's Geography Textbooks . Jai had a surprise for us. He took us for a walk around the northern periphery of the reservoir - something we could only dream about all those years when we went for hikes at this most popular 'water feature' . I do take off my hat to the Singapore authorities. They are certainly short of land space and natural greenery. But they do so much with the little they've got. Furthermore, with a population of 5.5 million within a land area of 718.3 sq km which means a population density of 7,615 per sq km - they have done a remarkable job in training their citizens to be proud of their country, by keeping the environment clean and tidy. All I can say is "Wake up Malaysia!!" On that walk of nearly an hour - we have these to 'show and tell'. A trefoil of three rubber seeds in a pod. To think; when Ridley brought these seeds to Singapore for trial-planting, it marked - for the Malay Peninsula - the beginning of an industry and an economy that brought wealth and development (for some - mainly non-natives) and chaos and lopsidedness to the Malays who were left on the fringe. It was a boom for some and bust for others. 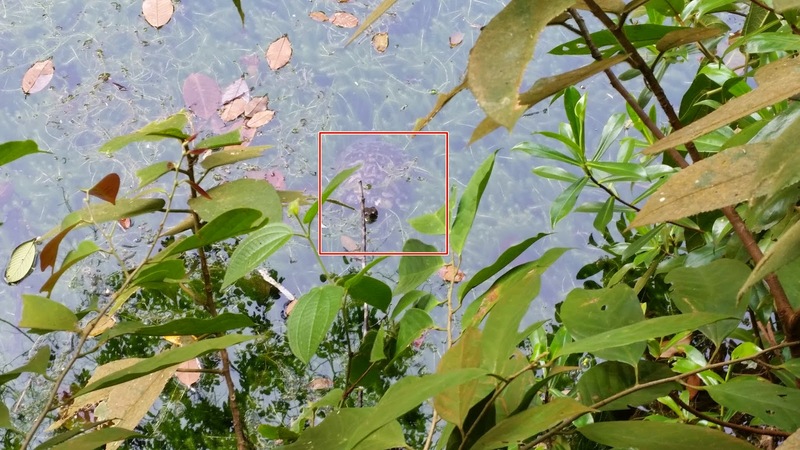 As we were walking on the wooden platform along the edge of the reservoir, we heard this very slight movement of water. We turned and this was what awaited us! All in all. 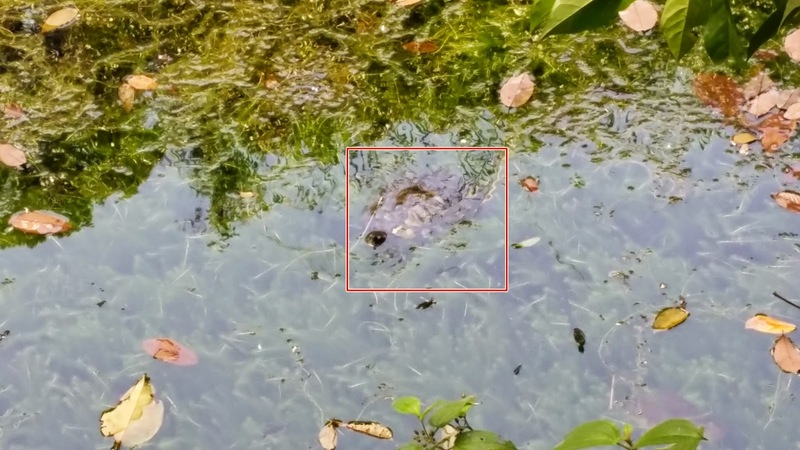 we observed 3-4 terrapins in the water and just at the edge there was a little notice informing members of the public not to release their unwanted terrapins in the Reservoir! We have a similar problem up here. Where we live in KL a number of domesticated cats have been 'released' in our neighbourhood - leaving us and our neighbours who care for cats with more strays to look after. Whenever we get to Singapore, Jai will always be available to help us get to Pusara Abadi at Yio Chu Kang Road to 'menziarah' the graves of my father and brother. 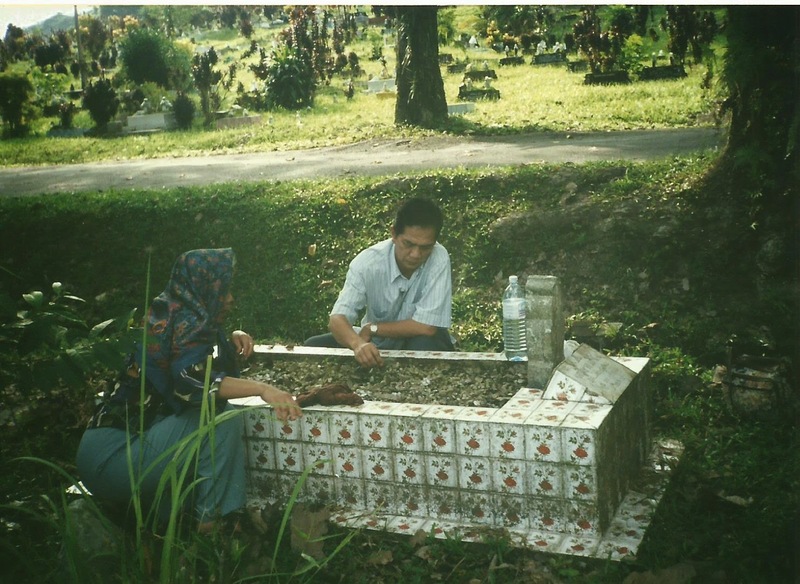 This time, we also visited the grave of Jai's mother - arwah Macik Alimah who passed away 3 months ago. Al -Fatihah to the three beloved. You see, going back to Singapore is very much like visiting an abode where the furniture is being moved about ever so often. ........ and my brother's at Pusara Aman. My sister and family at Pusara Abadi. ....... downsizing of the previous plots at Pusara Aman. Eight to a plot - if the families claim the remains. I cannot resist saying this again - Wake up Malaysia and Malaysians! Do you know how fortunate you are? You all have a choice in the size and location of a piece of Malaysia for your dear departed! 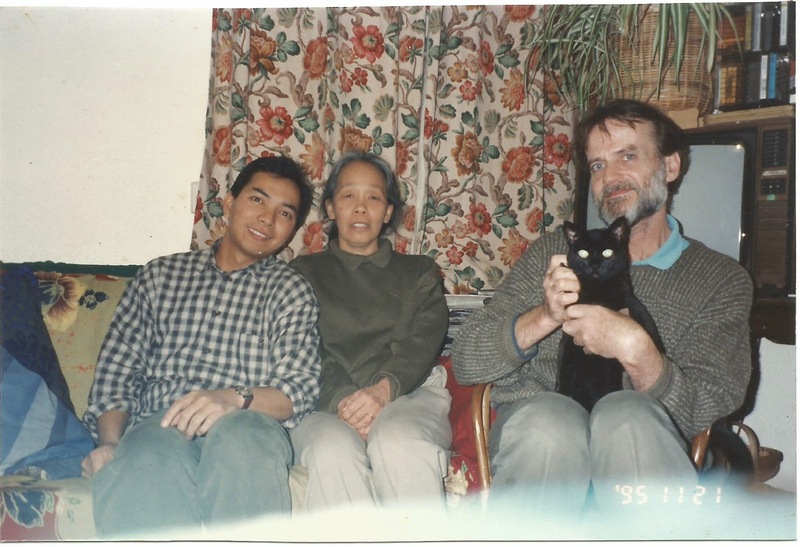 Dear Jai, remember this at our Oxford Avenue house in Leicester 1995? And you have now become our host at your house since 2005(?). Irene and the two septuagenarians, 2015. Finally here's a beautiful song for three beautiful people in Singapore - Jai, Irene and Lely. This is my favourite concerto, it's so sweet and longing - just how I feel about the ones who have left me forever - in Batu Pahat and Singapore. In the context of all the war and bloodshed and violence since the end of the Second World War, it is heartening that the United Nations undertook to adopt the 2010 proposal of King Abdullah II of Jordan to commemorate a World Interfaith Harmony Week for every first week of February. The 'harmony' desired is for " Muslim and Christian leaders to engage in a dialogue based on two common fundamental religious Commandments : Love of God, and Love of the Neighbour." These two commandments they say, are also part of another monotheistic religion - Judaism. 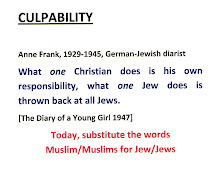 TWIHW added two more commandments " Love of the Good and Love of the Neighbour", so as to include "those of other faiths and those with no faith". Of course Malaysia is a participant in TWIHW and it was officially launched on 5 February by Tan Sri Joseph Kurup, the Minister in charge of unity in the Prime Minister's Department. However the celebration has been clouded by the photograph of an apparently Muslim woman ; a representative of YIPCI (Young Interfaith Peacemaker Community of Indonesia) carrying a placard " I'm Muslim, I love Hindus" at Batu Caves during Thaipusam on 3 February. ISMA (Ikatan Muslimin Malaysia) "took issue", questioning the source and the motives of YIPCI's 'campaign' at Batu Caves during Thaipusam. The Minister however put a positive mark on this foreign-based YIPCI's 'campaign' in Malaysian territory. He regarded it as "proof of positive interfaith ties and how people of different religions can respect each other". Call me stupid. But I'm perplexed. What made this Muslim (?) from Indonesia decide to come to Malaysia, to make a special trip to Batu Caves during Thaipusam to demonstrate and publicise her message - which on the surface seems positive and moderate - but which carries the imputation that Muslims in Malaysia are 'neglectful' about 'loving' Hindus and so a Muslim(?) 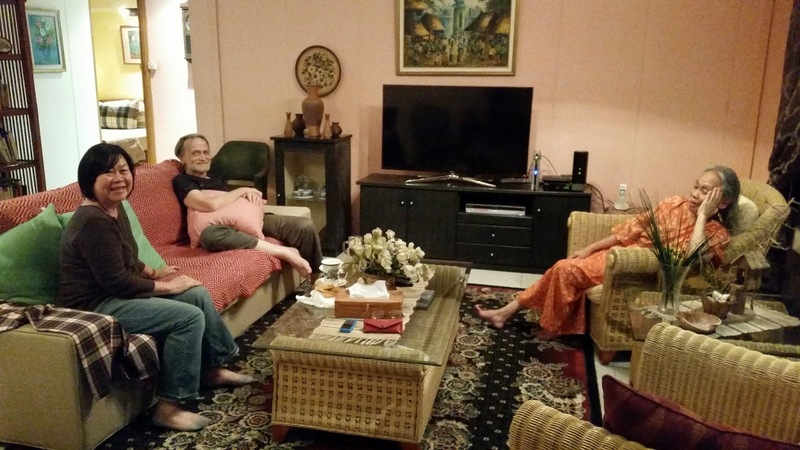 representing an interfaith NGO from overseas has to make amends on behalf of the 'uncaring' Muslims in Malaysia? Was she called upon to push and enforce this unnecessary and unsolicited (?) plea? I understand that YIPCI was set up by two students, a Christian and a Muslim. This being an Interfaith Peacemaker Community, was there also a Christian there with a placard " I'm Christian. I love Hindus." Maybe not, because we all know that when Christians "love" you, they carry other connotations. And if it is really "interfaith" was there a "I'm Hindu. I love Muslims." placard anywhere? Somehow for a cynical person like me, the use or rather the over-use of the word "love" sounds phony, misplaced and worse of all, smacks of condescension. I remember seeing this logo as from the 1980s ( at least from my wandering experience) on T-shirts and baseball caps. The copycats came along with "I love pink", "I love Cappucino" etc. etc. 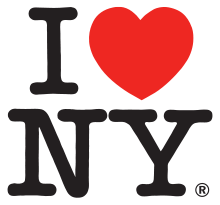 When this logo which began as an advertising campaign to promote tourism in New York was used for " I love Islam", "I love Allah" , "I love the Prophet", - sometimes substituting the word "love" with the heart symbol, my heart sank. Over 1400 years of Islam ! Why should ANY Muslim - from over 1.6 billion of them - resort to this kind of pseudo-Christian pop culture icon to parade their devotion to their religion? Let's get back to basics - away from the language of advertisement and pop social media. no score - as in games. If someone comes up to me and and says "I'm a Christian (or Hindu, or atheist or sun worshipper). I love Muslims." I have to ask if they could please not 'love' Muslims. Could they 'respect' us Muslims instead? Of course 'respect' - as they say - has to be earned. But even if you don't love someone or some belief system, you should still respect them. Love without respect is dangerous. In response to Isma's opinion about YIPCI, the Minister for Unity, Tan Sri Joseph Kurup asserted that "moderation, toleration and unity is the key for the country to progress further." Where's the place for "respect"? If there is a solution to racism, religious persecution, and the evils of nationalism, I think we can be assured that it is not love. I recall some decades back when the churches were breaking the color barrier, a Southern priest wrote of the waves of nausea he felt when he gave communion to a black person. Incredible, you might say. But our antipathies towards others have deep and stubborn roots. 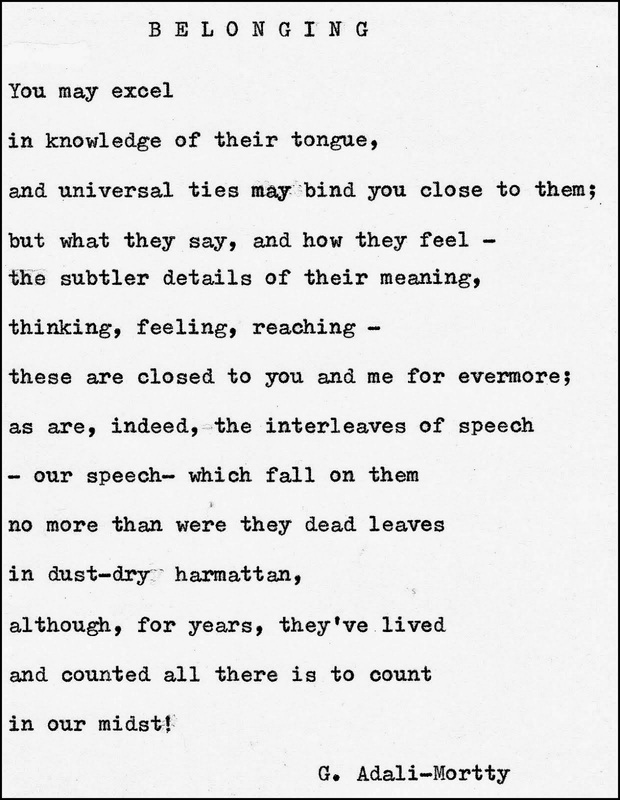 To ask that we love may well be an impossibility. To ask that we show respect is not only attainable, it helps us attain our own happiness as well. When (Edward) de Bono speaks of respect as the basis of happiness, he is not breaking new ground. Respect is no less than justice. I like de Bono's ideas. Respect myself, respect others, respect society. This is a manifesto I can live with. But above and beyond our theory and practice of Love and Respect - the ultimate yardstick is our NIAT. And only Allah Knows. Abah taught us this song "It'a a sin to tell a lie" in the 50s and we used to belt it out with our Abah in the kampung house, much to my mother's amusement.